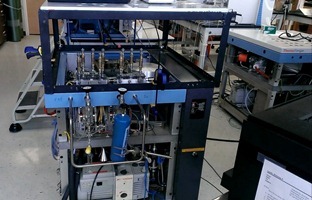 The Department of Earth and Environmental Sciences at the University of Kentucky has establishment a state-of-the-art stable isotope geochemistry lab that contains three isotope ratio mass spectrometers (Finnigan Delta and MAT253) with associated peripheral devices (EA, TC/EA, Gasbench, GC-C, dual inlet) for the elemental and isotope analysis (H, C, O, N, S, Cl) of solids, liquids and gases; two cavity ring down spectroscopy systems (Picarro) for the real-time in situ analysis of the chemical and isotope composition of trace atmospheric gases (CO2 and H2O); a thermogravimetric (TGA/DSC) analyzer for the characterization of crystalline and amorphous materials; a GC-MS (Varian) equipped with a pyro-probe for the chemical separation and identification of non-volatile and volatile constituents; and associated equipment for the preparation of samples for elemental and stable isotope analysis (e.g., computer driven micro-drill; various petrographic microscopes with CL and epi-fluorescence capabilities; cryogenic grinders; auto-titrators; rotary evaporators; freeze driers; various centrifuges; organics and inorganics laminar flow hoods; autoclave; incubators; ultra-cold storage; micro-balances; and other ancillary wet chemistry equipment). The CAMECA SX50 electron probe micro-analyzer at UK is a fairly standard “microprobe”, capable of obtaining rapid, nondestructive quantitative micron-scale analysis of solid materials consisting of the elements carbon through uranium. The instrument has four wavelength dispersive spectrometers for quantitative analysis; a silicon-drift detector used mainly for rapid semi-quantitative analysis via energy dispersive spectrometry; a KE Designs cathodoluminescence (CL) detector for imaging micron-scale compositional zoning in zircon and calcite; and a secondary (SE) and backscattered electron (BSE) detector for compositional and textural imaging. We use the SAMx automation for WDS and EDS, and for imaging purposes. We mostly analyze minerals in rocks, but we also analyze alloys, semiconductors, ceramics (modern and archeological), and glasses. 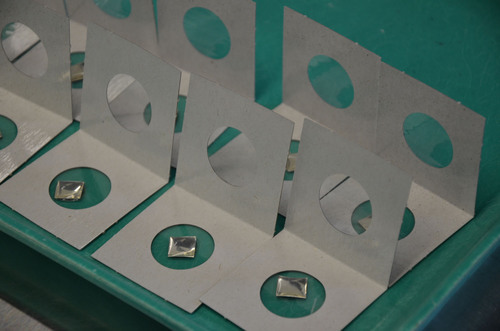 The sample holder can accommodate standard petrographic thin sections and 1” diameter round samples. Gabe, Susan and Ryan on "the probe"
The instrument is made available to the entire academic community at UK (Engineering, KGS, Anthropology, Physics). We have had visiting students and faculty from the University of Cincinnati; Syracuse, Auburn, and Miami Universities; Murray State, Western and Eastern Kentucky Universities. Interested users should contact Dave Moecher (moker@uky.edu). Interested users should contact Prof. Kevin Yeager (kevin.yeager@uky.edu). 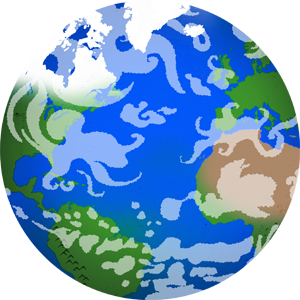 The Fluid inclusion laboratory consists of a U.S.G.S. 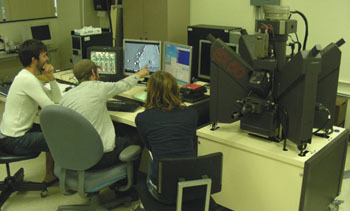 heating-cooling stage mounted on a Leitz microscope with digital camera attachment and video monitor. Temperatures are calibrated using experimental standards. the University of Kentucky Digital Seismic Network, including a regional strong-motion and seismic monitoring network (comprised of 15 short/intermediate period seismometers and 10 strong-motion accelerometers), concentrated on the New Madrid Seismic Zone (Dr. Zhenming Wang). the UK Department of Earth and Environmental Sciences Seismic Lab including equipment for near-surface exploration and engineering seismology (Prof. Ed Woolery). the UK Geophysics Lab includes gravity, magnetic, frequency domain electromagnetic equipment and software for regional, near-surface environmental, and archaeological investigations (Prof. Dhananjay Ravat).